With over 100 varieties of potatoes sold in the U.S., Russets, also called baking potatoes or Idaho potatoes, are the most widely used, according to the United States Potato Board. But CropWatch, a website sponsored by the University of Nebraska–Lincoln, noted in 2014 that Yukon Golds, a variety of yellow potato, have found popularity in supermarkets, and have a higher price tag than Russets. The two potatoes come from the same biological family, but differ in significant ways. Choose Russets and Yukon Golds in the same way -- by picking those with firm flesh, without green spots, sprouts or bruises. Both potatoes continue to ripen after they're picked; to slow down the process, avoid refrigerating the potatoes, which causes their starch molecules to turn to sugar, encourages sprouting and changes their flavors and textures. Keep the potatoes in a drawer where it's dark, to minimize the formation of bitter, green chlorophyll and alkaloids. The differences in the appearance of Russets and Yukon Golds are dramatic. Oval-shaped Russets have brown, thick skin and are usually larger than Yukon Golds. Their flesh is typically white, but sometimes appears as pale yellow. Yukon Golds have a more rounded shape than Russets, with very thin, light tan or yellow-tinged skin. The flesh is always yellow on a Yukon Gold. The high starch and low moisture in Russet potatoes make fluffy mashed potatoes when all the starch molecules expand and burst during cooking. Russets average about 20 to 22 percent of their content as starch, according to the "Cook's Illustrated" website. On the other hand, Yukon Golds contain from 18 to 20 percent starch, and fall into the medium starch and medium moisture category. In addition to choosing Russets for mashed potatoes or to thicken a soup, where they will tend to fall apart, use them too for french fries, because their low moisture content results in crispy fries. Yukon Golds hold their shape better than Russets. 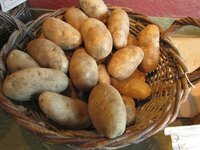 Choose Yukon Golds for potato salad or soups where you want the potatoes to remain intact. Because Yukon Golds have medium levels of starch and water, they also work for mashed potatoes.